Absolute Calibration is pleased to announce that they can now calibrate temperature devices down to -90°C under their UKAS accreditiation. Low temperatures, down to -90°C are achieved using an AMETEK JOFRA Advanced Temperature Calibrator - ATC-125B. The JOFRA ATC-125 ultra cooler features a unique free piston stirling cooler technology for optimum performance and superior temperature homogeneity throughout the block at very low temperatures. 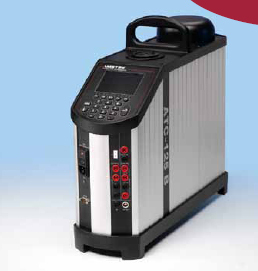 The JOFRA ATC-125 ultra cooler is the world's first temperature dry-block calibrator capable of reaching -90˚C. Please do not hesitate to contact our HelpDesk for further information.